An abortifacient ("that which will cause a miscarriage" from Latin: abortus "miscarriage" and faciens "making") is a substance that induces abortion. Abortifacients for animals that have mated undesirably are known as mismating shots. Common abortifacients used in performing medical abortions include mifepristone, which is typically used in conjunction with misoprostol in a two-step approach. Oxytocin is commonly used to induce abortion in the second or third trimester. There are also several herbal mixtures with abortifacient claims, though there are reports that they may have caused severe side-effects, including death. Prostaglandin analogues, such as misoprostol or gemeprost (both synthetic prostaglandin E1 (PGE1) analogues), are often used to terminate pregnancy up to 24 or 60 days of gestation, in combination with mifepristone (a progesterone receptor antagonist) or methotrexate (an antifolate). Misoprostol administered vaginally is more effective than when administered orally. Misoprostol is approved in France under the trade name GyMiso for use with mifepristone for medical abortion. Misoprostol is used off-label with mifepristone for medical abortion in the U.S. Dinoprostone, given by the extra-amniotic route, can be used for late abortion (second trimester). Mifepristone is a progesterone receptor antagonist also known as RU-486. It is marketed under the trade name Mifegyne in France and countries other than the U.S., and under the trade name Mifeprex in the U.S. It is used in conjunction with a prostaglandin analogue. Misoprostol alone is sometimes used for self-induced abortion in Latin American countries where legal abortion is not available, and by people in the United States for whom it is easier or cheaper than a legal abortion in a clinic. The ancient Greek colony of Cyrene at one time had an economy based almost entirely on the production and export of the plant silphium, considered a powerful abortifacient. 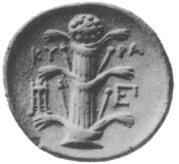 Silphium figured so prominently in the wealth of Cyrene that the plant appeared on coins minted there. Silphium, which was native only to that part of Libya, was overharvested by the Greeks and was effectively driven to extinction. The standard theory, however, has been challenged by a whole spectrum of alternatives (from an extinction due to climate factors, to the so-coveted product being in fact a recipe made of a composite of herbs, attribution to a single species meant perhaps as a disinformation attempt). As Christianity and in particular the institution of the Catholic Church increasingly influenced European society, those who dispensed abortifacient herbs found themselves classified as witches and were often persecuted in witch-hunts. Medieval Muslim physicians documented detailed and extensive lists of birth control practices, including the use of abortifacients, commenting on their effectiveness and prevalence. The use of abortifacients was acceptable to some Islamic jurists provided that the abortion occurs within 120 days of conception, the time when the fetus is believed to receive its soul, though others considered the procedure fully prohibited. In English law, abortion did not become illegal until 1803. English folk practice before and after that time held that fetal life was not present until quickening. "Women who took drugs before that time would describe their actions as 'restoring the menses' or 'bringing on a period'." Abortifacients used by women in England in the 19th century (not necessarily safe or effective) included diachylon, savin, ergot of rye, pennyroyal, nutmeg, rue, squills, and hiera picra, the latter being a mixture of powdered aloe and canella. During the American slavery period, 18th and 19th centuries, cotton root bark was used in folk remedies to induce a miscarriage. The use of herbs as abortifacients can cause serious – even lethal – side effects. Such use is dangerous and is not recommended by physicians. ^ Planned Parenthood. "The Abortion Pill (Medication Abortion)". Archived from the original on 7 February 2009. Retrieved 22 January 2009. ^ Riddle, John M. (1992). Contraception and Abortion from the Ancient World to the Renaissance. Cambridge, MA: Harvard University Press ISBN 0-674-16876-3. ^ a b c Rod Flower; Humphrey P. Rang; Maureen M. Dale; Ritter, James M. (2007). Rang & Dale's pharmacology. Edinburgh: Churchill Livingstone. ISBN 0-443-06911-5. ^ Bartley J, Brown A, Elton R, Baird DT (October 2001). "Double-blind randomized trial of mifepristone in combination with vaginal gemeprost or misoprostol for induction of abortion up to 63 days gestation". Human reproduction (Oxford, England). 16 (10): 2098–102. doi:10.1093/humrep/16.10.2098. PMID 11574498. Retrieved 29 October 2008. ^ Kulier, Regina; Kapp, Nathalie; Gülmezoglu, A. Metin; Hofmeyr, G. Justus; Cheng, Linan; Campana, Aldo (9 November 2011). "Medical methods for first trimester abortion". The Cochrane Database of Systematic Reviews (11): CD002855. doi:10.1002/14651858.CD002855.pub4. ISSN 1469-493X. PMID 22071804. ^ Gordon, R.P. (2007). The God of Israel. Cambridge University Press. p. 128. ^ Berquist, Jon L. (2002). Controlling Corporeality: The Body and the Household in Ancient Israel. Rutgers University Press. pp. 175–177. ISBN 0813530164. ^ Levine, Baruch A. (1993). Numbers 1-20: a new translation with introduction and commentary. 4. Doubleday. pp. 201–204. ISBN 0385156510. ^ Snaith, Norman Henry (1967). Leviticus and Numbers. Nelson. p. 202. ^ Olson, Dennis T. (1996). Numbers: Interpretation: A Bible Commentary for Teaching and Preaching. Westminster John Knox Press. p. 36. ISBN 0664237363. ^ Brewer, Julius A. (October 1913). "The Ordeal in Numbers Chapter 5". The American Journal of Semitic Languages and Literatures. 30 (1): 46. ^ Biale, Rachel (1995). Women and Jewish Law: The Essential Texts, Their History, and Their Relevance for Today. Random House Digital. p. 186. ISBN 0805210490. ^ a b c Frymer-Kensky, Tikva (1 January 1984). "The Strange Case of the Suspected Sotah (Numbers V 11-31)". Vetus Testamentum. 34 (1): 11–26. doi:10.1163/156853384X00025. ISSN 1568-5330. ^ a b Rossetti, Chip (July – August 2009). "Devil's Dung - The World's Smelliest Spice". Saudi Aramco World. Vol. 60 no. 4. pp. 36–43. Archived from the original on 15 June 2013. ^ Isaacs, Jennifer (1987). Bush Food: Aboriginal Food and Herbal Medicine. Weldons. ISBN 978-0-949708-33-5. ^ Kramer, Heinrich, & Sprenger, Jacob. (1487). Malleus Maleficarum. (Montague Summers, Trans.). Retrieved 3 June 2006. ^ Sheikh, Sa'diyya (2003). "Family Planning, Contraception, and Abortion in Islam". In Maguire, Daniel C. (ed.). Sacred Rights: The Case for Contraception and Abortion in World Religions. Oxford University Press US. pp. 105–128 [105–6]. ISBN 0-19-516001-0. ^ McLaren, Angus (1978). Birth Control in Nineteenth-Century England. Holmes & Meier Publishers, Inc. US. pp. 31, 246. ISBN 0-8419-0349-2. ^ Dunglison, Robley (1874). A Dictionary of Medical Science. Henry C. Lea. p. 501. ^ "environment: YALE magazine - Fall 2010". environment.yale.edu. ^ Ciganda, C.; Laborde, A. (2003). "Herbal infusions used for induced abortion". Journal of Toxicology: Clinical Toxicology. 41 (3): 235–239. doi:10.1081/CLT-120021104. PMID 12807304. ^ Kutner, Jenny (6 January 2016). "Women Are Learning about Herbal Abortion Online -- Here's Why That's a Problem".